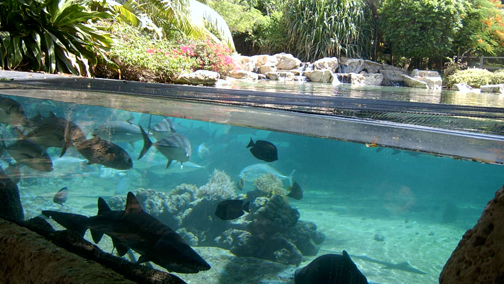 Building a 500,000 gallon aquarium is not an endeavor that you just jump into. Often times, the design and planning stages of such large projects can take 2 years or more. The process begins with a series of conceptual drawings which are presented to the client for review, revision and hopefully approval. 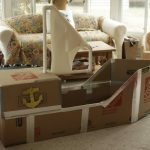 This stage is then followed by the creation of a scale model to provide the client with a miniature representation of the overall aquarium including the placement of rockwork and other themed elements. 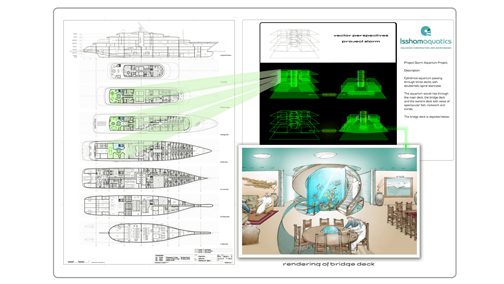 Conept design of a residential shark aquarium. During my time at Issham Aquatics, we often teamed up with a talented American artist who helped put our collective aquatic vision onto paper. We would have great brainstorming sessions whenever he would visit the Middle East from his home in Oregon. 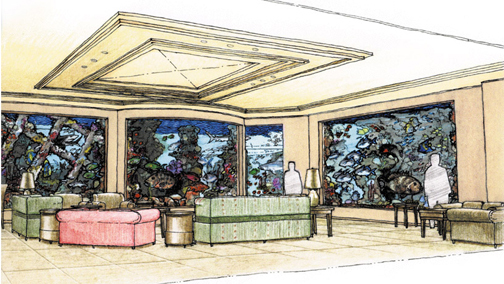 From a 20 ft. tall aquarium on a yacht to shark tanks, the more grand and over the top the ideas, the better! 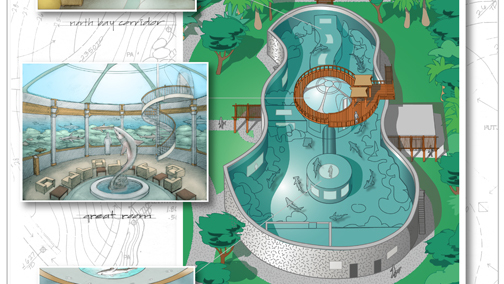 Not all of the designs we penned made it to construction, but many did. Building residential aquariums on a massive scale takes serious logistics, coordination and project management. 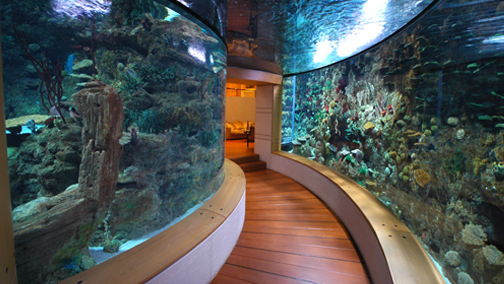 No one company in the world has the capability to pull off a 500,000 gallon aquarium on their own. As such, we would utilize a number of international specialty subcontractors for specific items. Acrylic would often be sourced and installed by Nippura Co. in Japan. 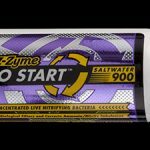 They are the same company that supplies acrylic for the Georgia Aquarium and other public aquariums worldwide. 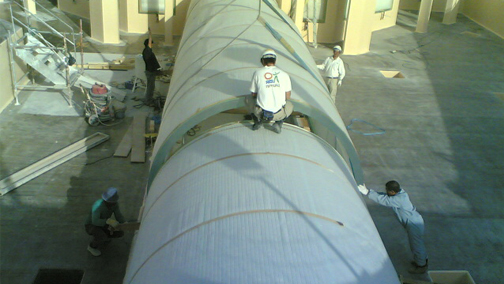 These massive acrylic panels, tunnels and cylinders would be shipped to us in special sea freight containers and installed by Nippura Technicians. The method and material used to achieve their almost invisible acrylic bonds is a closely guarded proprietary secret. These large closed systems are generally densely stocked with large predators that produce copious amounts of waste. To filter these huge systems 50hp pumps and PVC or HDPE pipes of 14″ diameter or more are used. 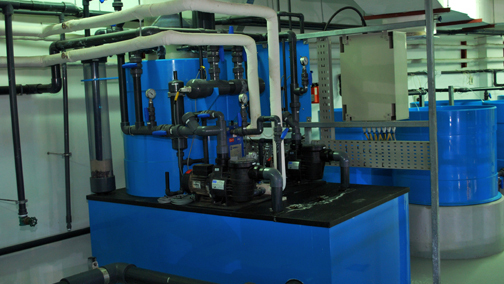 We often teamed up with International Aqua-Tech from the UK to design and build the complex filtration systems. 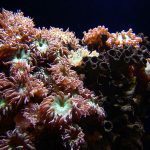 They build some of the best filtration systems I’ve ever seen and were among the companies to employ SCADA (supervisory control and data acquisition) controlled aquarium systems. 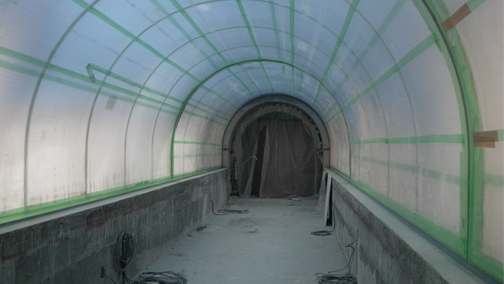 They also use a cool blue coloured PVC and HDPE material to build much of their equipment. 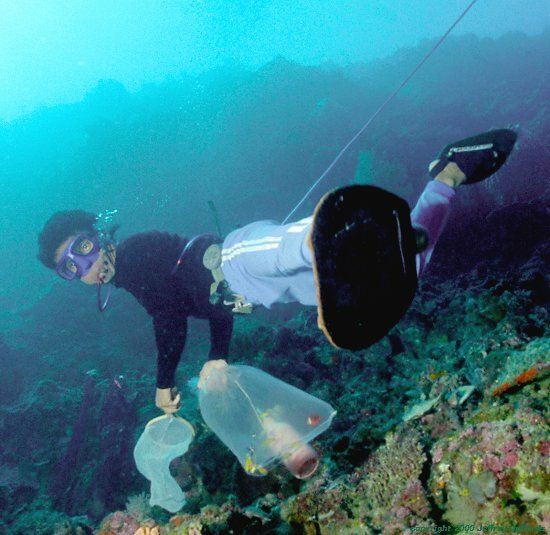 A fish collector in the Philippines uses homemade gear. 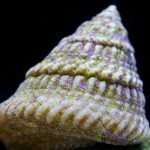 Collecting and quarantining thousands of fish for a single exhibit was always a challenge. Thankfully, Issham had two collecting stations on the Red Sea. The experienced divers were usually from the Philippines where they had honed their fish collecting skills from childhood. 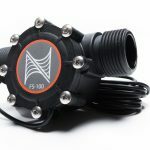 We would offer them modern dive gear, but most preferred to dive using the homemade equipment they had grown up using. The divers loved their fins made from 5 gallon plastic buckets and used a free-flowing air source that was simply a plastic/rubber hose that was attached to a home-made air compressor at the surface. The hose would continuously bubble air and the divers would simply bit down on the hose to stop the airflow. 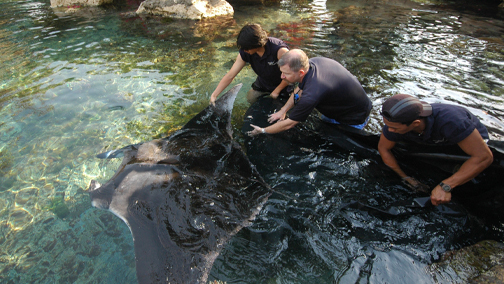 A small Manta Ray is introduced into a 500,000 gallon residential saltwater lagoon. It is hard to describe the feeling I would get after seeing the completed aquariums for the first time. 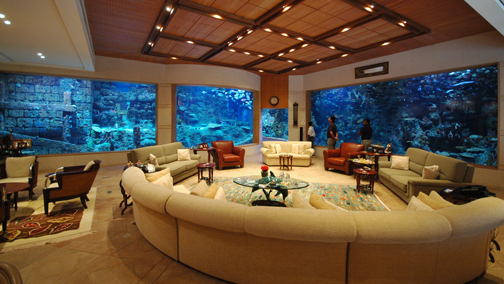 To this day, I can honestly say that the residential aquarium projects that I was involved in during my 5+ plus years with Issham (3yrs as Director of Operations, 2yrs as Coprotate Curator) were truly some of the most spectacular aquariums on the planet and could compete with the best public aquariums anywhere. 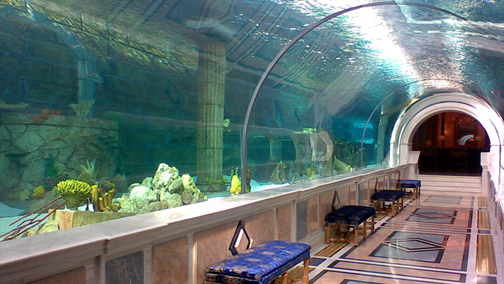 A 500,000 gallon Shark Lagoon at a private residence. 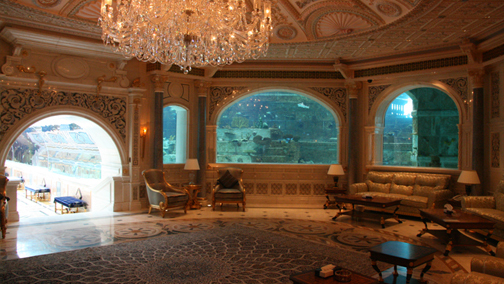 A 150,000 gallon home aquarium. 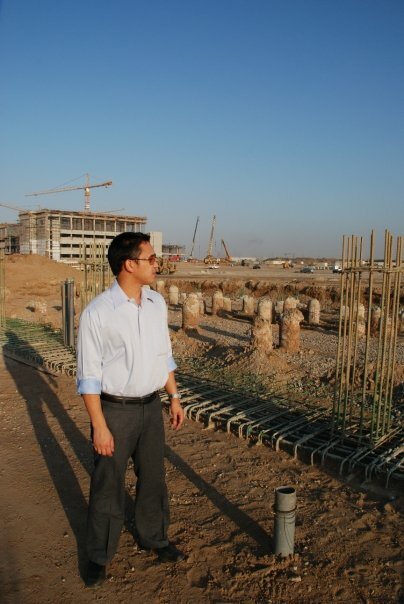 The author surveys the future site of a Marine Research Center in 2009.